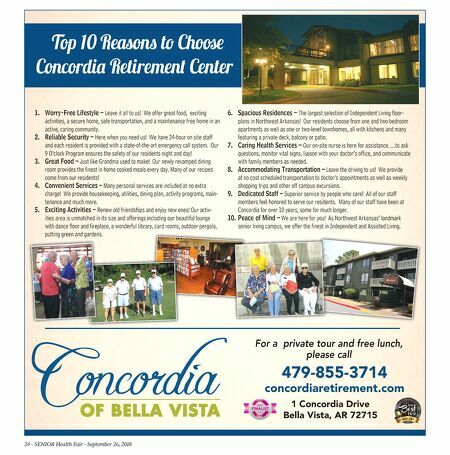 24 - SENIOR Health Fair - September 26, 2018 479-855-3714 concordiaretirement.com 1 Concordia Drive Bella Vista, AR 72715 Top 10 Re ons to Cho e Concordia Retirement Center For a private tour and free lunch, please call 1. Worry-Free Lifestyle – Leave it all to us! We offer great food, exciting activities, a secure home, safe transportation, and a maintenance free home in an active, caring community. 2. Reliable Security – Here when you need us! We have 24-hour on site staff and each resident is provided with a state-of-the-art emergency call system. Our 9 O'clock Program ensures the safety of our residents night and day! 3. Great Food – Just like Grandma used to make! Our newly revamped dining room provides the finest in home cooked meals every day. Many of our recipes come from our residents! 4. Convenient Services – Many personal services are included at no extra charge! We provide housekeeping, utilities, dining plan, activity programs, main- tenance and much more. 5. Exciting Activities – Renew old friendships and enjoy new ones! Our activ- ities area is unmatched in its size and offerings including our beautiful lounge with dance floor and fireplace, a wonderful library, card rooms, outdoor pergola, putting green and gardens. 6. Spacious Residences – The largest selection of Independent Living floor- plans in Northwest Arkansas! Our residents choose from one and two bedroom apartments as well as one or two-level townhomes, all with kitchens and many featuring a private deck, balcony or patio. 7. Caring Health Services – Our on-site nurse is here for assistance….to ask questions, monitor vital signs, liaison with your doctor's office, and communicate with family members as needed. 8. Accommodating Transportation – Leave the driving to us! We provide at no cost scheduled transportation to doctor's appointments as well as weekly shopping trips and other off campus excursions. 9. Dedicated Staff – Superior service by people who care! All of our staff members feel honored to serve our residents. Many of our staff have been at Concordia for over 10 years, some for much longer. 10. Peace of Mind – We are here for you! As Northwest Arkansas' landmark senior living campus, we offer the finest in Independent and Assisted Living.